Call me a Johnny-come-lately. Or maybe I’m not the foodie I thought I was. Apparently olive oil and balsamic vinegar tasting bars have become popular in the U.S. over the past several years, but I only recently discovered them. Last year, wandering through the Galena River Wine & Cheese shop in Galena, Illinois, tasting cheese, crackers and preserves, I stumbled upon urns of flavored oils and vinegars with small cups alongside urging you to taste them. I thought it odd at the time, sipping olive oil and vinegar straight up. A few months later, at the Silver Moon Winery in Lanark, Illinois, I bought my first bottle of specialty vinegar—dark chocolate. (Are you surprised?) Winery co-owner Kathi Enzenbacher stocks several flavors of olive oils and balsamic vinegars, all available to taste, although as I recall, she had bread or other food items available to dip in them. Kathi provided recipes for each of the oils and vinegars, too. 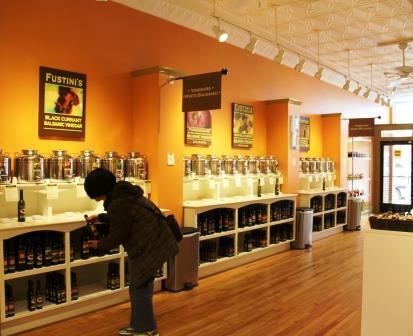 Within the past two months I’ve been in two shops that don’t have an olive oil and balsamic vinegar tasting bar, they are olive oil and balsamic vinegar tasting bars, with over fifty urns of gourmet, flavored oils and vinegars, all available for tasting. The shops also offer ultra-premium olive oil, the most nutritious and flavorful, in various varieties, some mild and some robust. 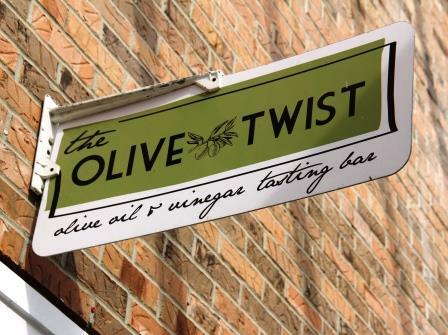 The Olive Twist, in Fort Wayne, Indiana opened in October 2010, and has an additional shop in Auburn, Indiana. 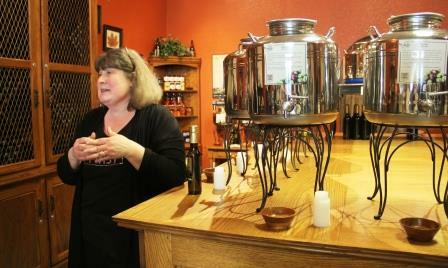 Co-owner Lori Berndt explained that olive oil has a shelf life of about a year from the time the fruit is crushed. The best olive oil is marked “extra virgin first cold pressed,” which means the oil wasn’t heated over a certain temperature, so it retains more nutrients and the fruit was crushed only one time. Once a flavor is added to the oil, it is no longer considered extra virgin. 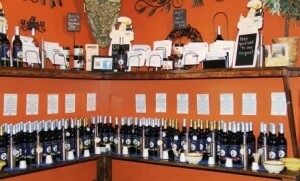 Balsamic vinegar comes from Medena, Italy. Grapes are cooked down to a caramelized state and aged many years. The vinegar sold at The Olive Twist is typically aged 18 years. When flavor infused, the balsamic vinegar is mixed with fine red wine vinegar. The Olive Twist offers classes to the public or can provide private classes. Class rates range from $35 to $100, depending on the dishes. Traverse City was the first location of Fustini’s, who now has four other Michigan stores and one on Maui. I happened to be in Traverse City on the day they were celebrating their sixth anniversary. 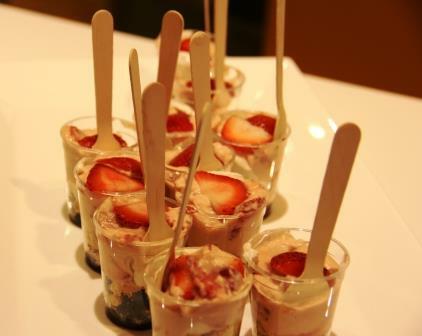 Besides regular oil and vinegar tastings, Chef Andy Stewart had prepared several appetizers and desserts using Fustini’s oils and vinegars. Fustini’s, owned by Jim Milligan, offers classes, too, from a demo class with four or five examples, to hands-on classes priced up to $59, but a $10 credit on a purchase. Because olive oil has a relatively short shelf life, both The Olive Twist and Fustini’s clear product from their shelves regularly, so that when customers purchase oil, they have the maximum amount of time to use it. To keep olive oil from going rancid quickly, keep it in a cool, dry place, out of sunlight and corked or capped to minimize contact with oxygen. Both companies donate the oil they clear from their shelves to local food pantries, who because they use it in volume, will consume it before the end of its shelf life. 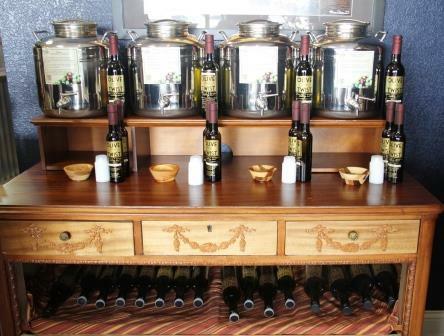 Once you purchase these deliciously flavored olive oils and vinegars, what do you do with them? Although they, of course, make great salad dressings, the possibilities don’t end there. They can be worked into dishes from appetizers to desserts and work well as marinades. Both companies’ web sites include many recipes. Experimenting is always fun, and to help you, pairing suggestions are listed on the urns. I purchased coconut balsamic vinegar and paired it with lime olive oil with the thought that it would make a great marinade for grilled shrimp. The dark chocolate balsamic that I bought I’m using for dessert with strawberries. I no longer find it odd to taste the oils and vinegars straight up. In fact, I like it. Now that I’ve discovered these tasting bars, I’ve added another must-do to my list for whenever I’m visiting a new town—new town, new flavors. Disclosure: My visits to the areas mentioned in this post were sponsored by the respective area tourism bureaus, but any opinions expressed are strictly mine.